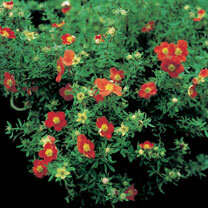 Potentilla fruticosa 'Marian Red Robin' is a hardy, deciduous shrub which, during the whole of summer and most of the autumn, displays vibrant, rich red flowers with bright yellow centre. A small variety of Shrubby Cinquefoil, this plant is ideal for the front of Shrub borders where it will shine out amongst the others, the grey/green foliage providing the perfect background for its blooms. Flowers May-September. Height 90-100cm (35-39"); spread 90-100cm (35-39"). Supplied in a 3 litre pot.